i’ve posted a few times my piled-up omelets on instagram and got a few people saying their #struggleisreal when it comes to making an omelet. there’s so many different ways to create these protein-packed disks out there and when we go to try a new method, either it sticks to the pan, falls apart or simply is just no where near #foodporn photo worthy. 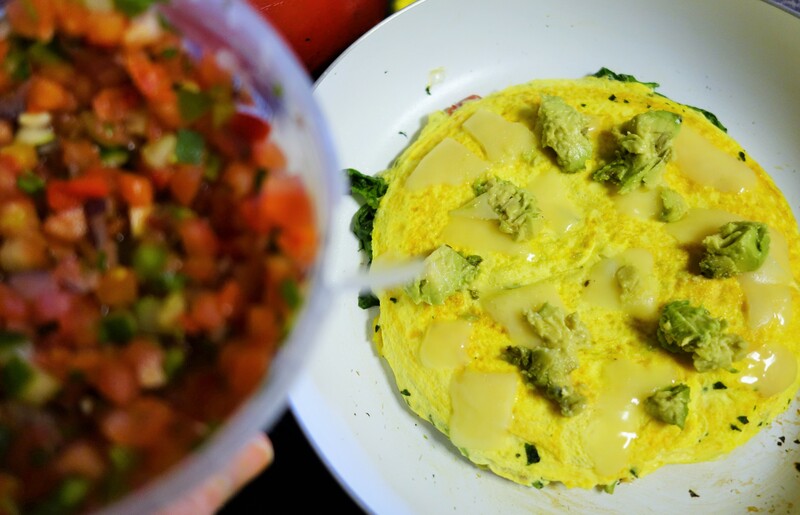 so i bring you my absolute GO-TO step by step how to build the perfect omelet with my special secret that makes it turn out perfect every darn time! step 1: and the super-secret (adios secret) tip to making it all work is setting up TWO pans. 1 small and 1 large. spray both with coconut oil or whatever oil you use for anti-stick. put both on medium/low heat. step 2: pour egg whites (i usually get real egg whites, some how ended up with these thinking they were egg whites. lesson learned!) into small pan and let sit while you do step 3..
step 3: in the larger pan that’s on medium/low heat too – toss in all your fillins’! i have peppers and spinach for this omelet. usually it’s whatever leftovers are in my fridge that need to be used up! step 4: let both pans sit for a while, stirring the veggies occasionally so they don’t stick. step 6: pour warmed up veggies onto the eggs (keep the heat on under the big pan when done and re-spray) then smoosh them down into the egg whites. step 7: let sit for a few minutes, again taking your spatula and ringing it around the edges. 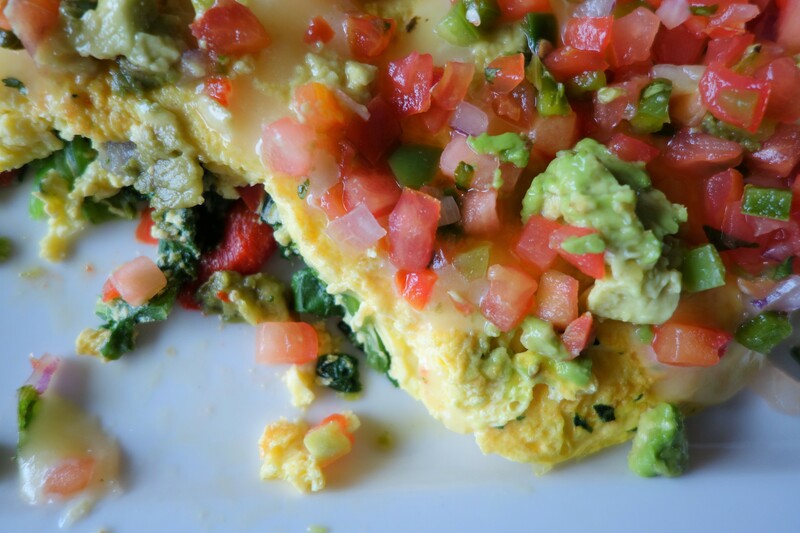 once you notice the inner part of the omelet is starting to “fluff up” now is to the next super-secret tip..
step 8: that big pan that you left the heat on under that’s empty? 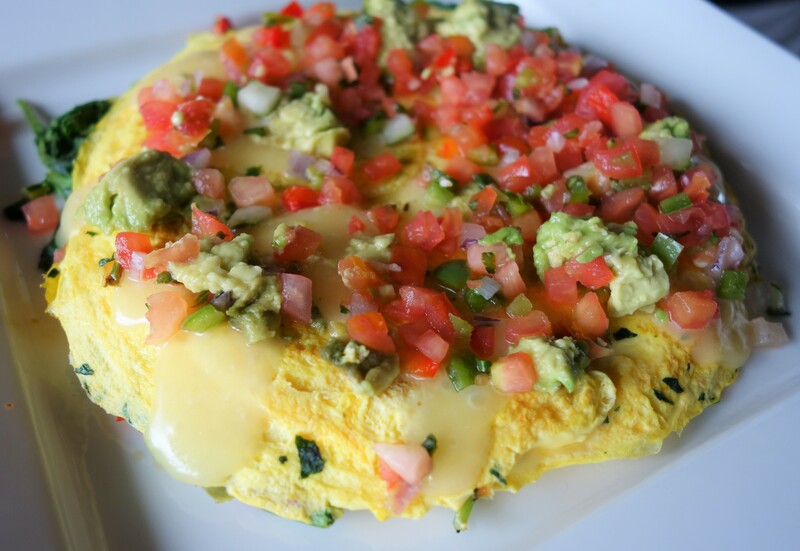 take your spatula to your eggs and wiggle under it so the omelet clearly isn’t stick to it, then FLIP that baby over onto the other pan! so it’s “face down”!! then keep it on low heat, add whatever other toppings you want. i have cheese, avocado and salsa! then let it sit for about 1-2 minutes so it not only finishes cooking all t he way through but heats up your toppings and helps the cheese melt! layers on layers of fully cooked eggy heaven!